Horace Mann Middle School and Metropolitan High School have been sharing the same facility for five months. The relationship between Horace Mann Middle School and Metropolitan High Charter School got off to a rocky start. 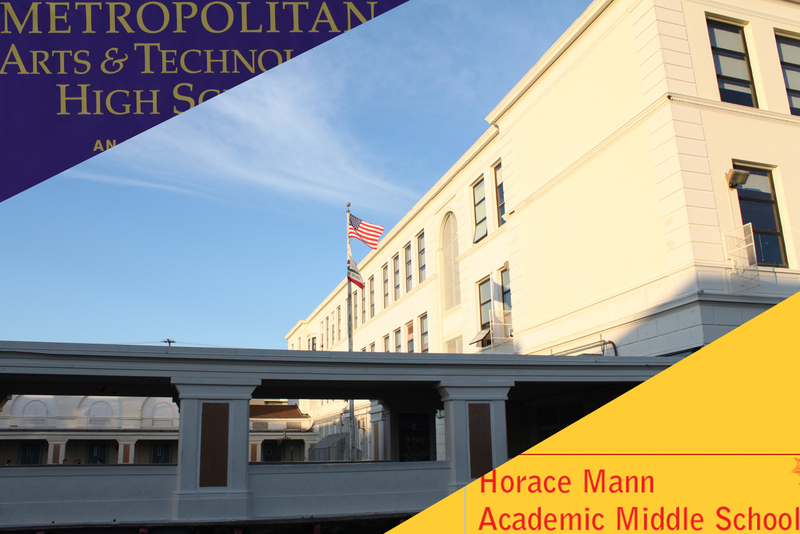 First, the San Francisco Unified School District suggested that since Horace Mann was at half its student capacity and Metropolitan High was looking for a location in the Mission, Metropolitan should just move into Horace Mann. Staff at Horace Mann said they didn’t think that was a very good idea, and no thanks. Then, a few months later, Horace Mann found out that Metropolitan High was moving in anyway. Legally, the San Francisco School District had to provide a space for Metropolitan, since it’s a public charter school, and so Horace Mann was overruled without being told. The process upset teachers more than the fact, said Horace Mann teacher Gail Eigl. After five months of sharing the same facility, most involved say that the problems many parents and some teachers feared have not developed. At the time, parents too were uneasy about the idea of middle school and high school students sharing the same space. But there are still some tensions, and the question of how long the high school will share Horace Mann’s space remains outstanding. “So far, it has been better than everyone thought,” said Metropolitan Principal Nick Kappelhof. Even though some faculty members are reluctant to work with the charter school, many of the hard feelings have been put aside, said Horace Mann science teacher Priscilla Owren. Most immediately, sharing the auditorium has been a major issue. “Scheduling events has been an issue, specially when both schools need the same room on the same date,” said Eigl. One of those events was National AIDS Day, December 1. A workaround was ultimately reached, Eigl said. Plans for Horace Mann to become a K-through-8 school would be impossible if Metro stays, said Eigl. Metro would prefer to stay in the Mission. Its lease with the SFUSD is up in another six months, but it doesn’t want to move again. Octavio Lopez Raygoza hails from Los Angeles. Lured by the nightlife, local eateries, and famous chilaquiles, Raygoza enjoys reporting in the Mission District. Although he settled in downtown San Francisco, he spends most of his time in the Mission.